No one who is familiar with Chase Utley should be all that surprised at what he did in the seventh inning of game 2 at Dodger Stadium, because he has been doing that sort of thing throughout his career. In the current climate of outrage, that is probably seen as an insult, but it is actually anything but. It is almost a rite of passage for older generations to complain about younger generations being too soft, too pampered, and too rich to really care about anything. Chase Utley, while not exactly a young man at this point, is still young enough to play professional sports, but old enough that he no longer has to prove anything to anyone. And yet, here he was, with the season on the line for the Dodgers, doing what it took to keep them alive this October, regardless of his OWN safety. Lost in all the outrage over the unfortunate injury to Ruben Tejada was the fact the Utley sacrificed HIMSELF in the process, as well. There is no sugarcoating here about what Chase Utley did. His slide was definitely late, and by his own admission, was designed solely to prevent Tejada of making the throw to first base, to double up Howie Kendrick. But it also needs to be said that part of the reason WHY Tejada got hurt was because he pivoted away from the baserunner, putting himself in a VERY awkward position to try making a throw to first. Colliding with Utley in the air, Tejada crumpled to the ground and broke his leg. It was an ugly sight, but like Buster Posey before him, the injury had as much to do with awkward positioning of the guy who got hurt, as it did with the collision itself. However, outside of Los Angeles, Philadelphia, and the traditional old-guard baseball community, most people do not see it that way. To them, Chase Utley is the villian. Ruben Tejada getting hurt was unfortunate, and Met fans and players are understandably furious. The New York media is going to have a field day with this. The Dodgers should be prepared for retribution. Surely, many will cheer if/when it happens- not just Met fans- which is another thing to think about. If Utley’s ultra-aggressive baserunning is so deplorable because it led to an UNINTENTIONAL injury, why in the world would it be a GOOD thing to cause an INTENTIONAL one? If the answer is, “Because Utley started it,” then what if retribution will be on someone besides him? (It probably will be, seeing how Utley barely even plays now.) Would it be okay, just because the guy was wearing a Dodger uniform? How is that any more acceptable in a civilized society than what Utley did? Moral posturing in everyday civilization is hard enough, let alone in professional sports. In one clip of many we see in modern day America, sadly, wondering “what’s wrong with baseball these days”, Keith Olbermann laments the lack of “menace” in today’s game. He made some good points about things that have been lost along the way, in well-intended but misguided efforts to make baseball safer. He states, with sincerity, that he does not advocate violence, yet also looks back wistfully at a Cubs-Mets game, where players DID get hurt in a game of beanball, while no one complained about it, nor demanded rule changes. And this points to where we are today. In our American sports, and probably sports throughout the world, we demand hard fouls, brushback pitches, and vicious tackles. When our team is losing and not doing these sorts of things, we scream that they are “soft” and have no heart. But then, on the occasion something DOES go wrong, we demand rule changes, and tsk-tsk at this sort of brutish behavior. So which one is it? Because on some level, sports IS sort of brutish- sometimes VERY brutish- as professional athletes have been trained throughout their lives to do what it takes to defeat their competition. As for what happened to Ruben Tejada, perhaps something should be done on SOME level, but what, exactly? Are we really going to start calling automatic double plays whenever a baserunner takes a hard slide into a fielder? How exactly do we define hard slides? We saw what happened when “The Buster Posey Rule” was first implemented, ironically to PROTECT catchers, yet ultimately resulted in awarding runs for players that were nowhere NEAR home plate when the ball arrived in the catcher’s mitt. Rules that create safety often diminish competition. (Think about the frequency that pass interference has been called in the NFL during recent years.) Major League Baseball will need to think hard about this, before coming up with yet ANOTHER rule that could further diminish its “menace”. What Else Happened In The Game? Too bad there’s so much focus on one play, because so much else went on during Saturday night’s exciting Dodger victory. Adrian Gonzalez looked like an amateur against Mets’ flamethrower Noah Syndergaard for three at bats, then delivered the go-ahead, two out double in the seventh inning. 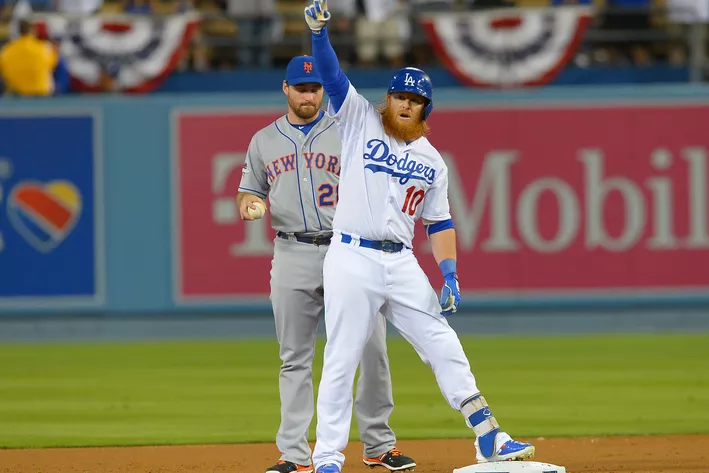 Howie Kendrick, Kiké Hernandez and Chris Hatcher yet again served as a reminder that life after Dee Gordon might not be so bad, after all, while Justin Turner served as a reminder to the Mets on what they missed out on. For the second night in a row, Corey Seager looked like a rookie at the plate, but made a catch in the field that would make one think otherwise. (Sort of a role reversal of what we were expecting.) Zack Greinke pitched well, in spite of allowing two home runs, but he truly missed out on what could have been the signature moment of the evening. After Terry Collins elected to intentionally walk the #8 hitter AGAIN, after almost getting burned by Kershaw in game one, he stuck to the same strategy. And once again, he almost got burned. ALMOST. AGAIN. Greinke crushed a ball into the gap, but it hung up just long enough to be caught in right field. Too bad, but at least in THIS game, it didn’t matter much in the end, thanks to that 7th inning rally. Finally- and BLISSFULLY- there is nothing to discuss about Don Mattingly’s managerial decisions. Oh, what the heck, we’ll do it anyway, but just for a few sentences. Everything he did was nearly spot on, as evidenced by the result. But pinch hitting for Andre Ethier with a three run lead, especially given Ethier’s RBI double early on, seemed excessive. But at least nearly everyone got in the game. Even Puig was brought in at the end, to a nice ovation. Brett Anderson versus Matt Harvey is a mismatch on paper, but regardless of the outcome, there will be a game 4. The first two games of this series were eerily similar to the first two of last year. Hopefully, the script flips from this point forward, although Dodger fans need to temper their expectations for game 3. At the very least, the vibe from Dodger Stadium after this year’s game 2 versus last year’s was much more positive. Hopefully, that will continue, as the team plays in a place that was built to look like Ebbets Field. If that isn’t good karma, I don’t know what is! This entry was posted in Dodgers and tagged chase utley, chris hatcher, corey seager, dodgers, justin turner, keith olbermann, mets, ruben tejada, zack greinke. Bookmark the permalink. ← NLDS Game 1 Recap Recap- Whoops!